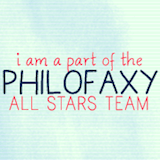 Let’s welcome Cori back to share part two of her Career Project – you can read part one HERE. Over the next 3 parts I am going to take you on a tour of two sections of my Career Project. 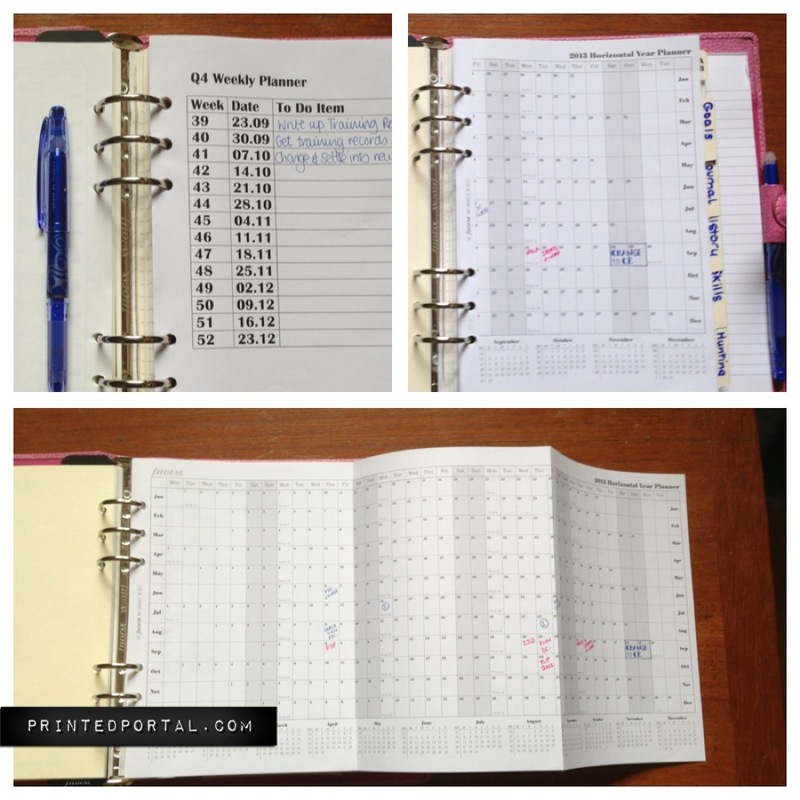 In this part I am taking a closer look at my Planner Section and my Goals Section. As I mentioned in part one of the Career Project the first section of my planner includes a Horizontal Yearly Planner and a Q4 Planner as there is no need for a daily or even weekly planner when it comes to the Career Project unless you are unemployed and are actively job hunting. My focus is career development therefore a yearly and Q4 planner will suit me perfectly. Career development occurs over a longer time frame (with short bursts of productivity when you are feeling extra motivated). 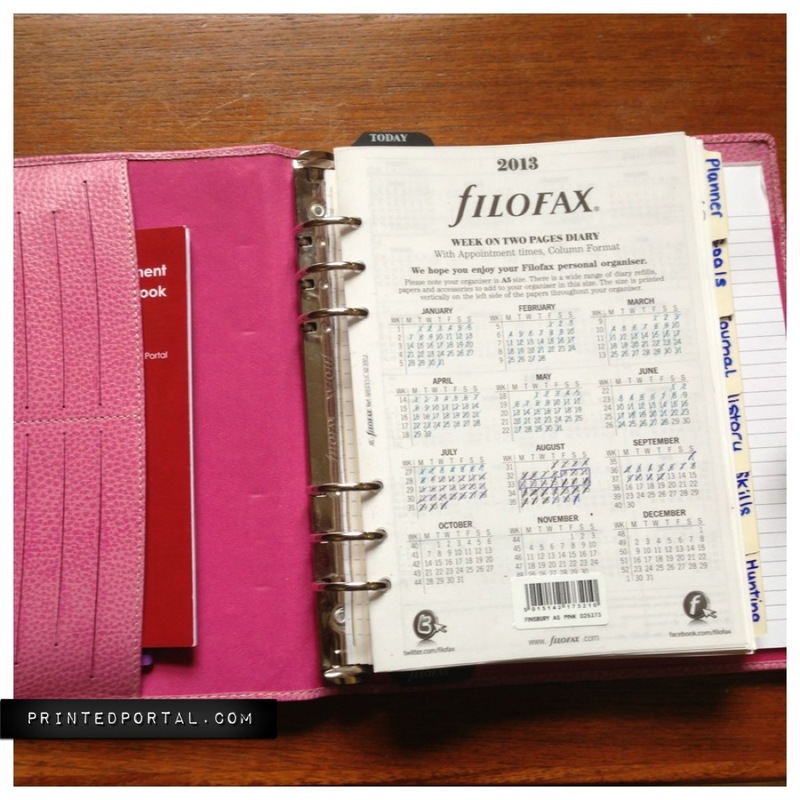 The Filofax 2013 Horizontal Planner gives me an overview of the year and what I have planned. I include things like: training days and courses, events and conferences, networking events, deadlines, interviews etc. If it works for you – colour code your yearly planner. I do as it makes it much easier on the eye. Letting you know what is going on and what you need to prepare for at a very efficient glance. My aim is to do a career boosting thing each week (in addition to writing in my career journal).The Q4 inserts which are available to download here are used to plan what Career Developing To-Do I want to do each week. That is my goal. It does not have to be a large thing, and it can be a simple step to making progress. At the moment I am only looking forward a couple of weeks as I change department at the end of the month and therefore don’t know how this will change my objectives. However, I find that having career boosting or progressing objectives set out and allocated to a specific week helps to actually get them done. If you don’t use your project planner (any project planner) on a regular basis or it has not become a habit yet it can be useful to schedule in some time in your regular Filofax to work on your project planner. I do this in 2 main ways (actually three if you count preparing these guest posts). • As I mentioned earlier I want to get into the habit of writing in my Career Journal on a weekly basis. Well I am useless at keeping a journal (career or otherwise). So in my regular Filofax I have scheduled in a regular hour slot for my career journal. If I am “in the zone” I can easily write for an hour and if I don’t need this full out I can use the time to review my goals/progress. (More Info on my Career Journal Section will be included in Part 3). • I try not to rigidly schedule the rest of my items. I simply want to look at my Q4 and to do list and see what I can do. However, If an item on my Q4 list on the specified week for no good reason. I specifically write it in to my Filofax the following week to make sure it gets done (and doesn’t bounce from week to week). As mentioned in Part 1 of this project the second section of my planner is for my Career Goals. 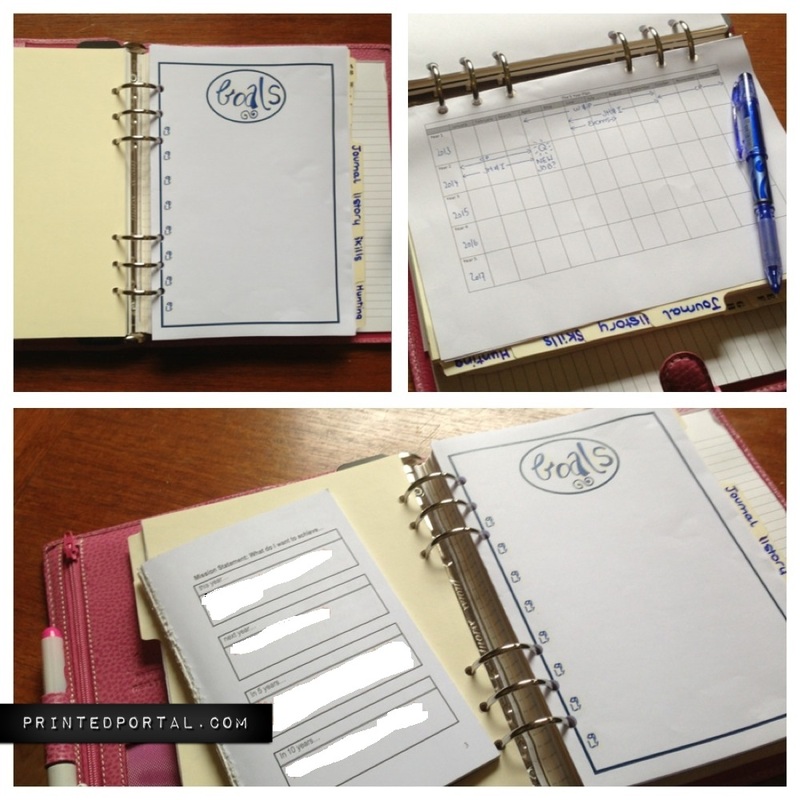 I already use my slimline Career Development Planner to actively record and review my goals. This is kept in the front cover of my Filofax. This keeps track of my goals and action plan for each goal along with progress review sheets which I complete every month (or whenever I feel like a review is due). I like having the ability to take my goals (and to dos) with me – it can fit in the front cover of both my personal and A5 Filofaxes so it can be in my daily planner when I am on the move. Being able to see it visually also prompts me to do things and work on my goals. In the actual Filofax section I keep my Master Goals List (available to download here) and my Five Year Plan Grid (available to download here). These lists are there to inspire me and remind me of what I want to achieve without bogging me down with my to-do list and day to day items. I also hope to build up a collection of inspiring reminders, quotes and achievements in this section as well over time. So that’s it – my Planner and Goals sections of my Career Project. In part 3 of the Career Project I will be looking at the next 2 sections in more detail: my career planner and my career history.